With an objective to fulfill the ever-evolving demands of our clients, we are engaged in offering a wide assortment of Cloth Sanitary Napkin. Sanitary Napkins. They have a unique strip that reduces irritation, infection and odor gives you peace of mind right through your period - even on the heaviest days. Owing to their quality features, these can be used by men or women who have urinary incontinence problems. We are stictching the reusable sanitary napkins ( called as safepads) with the support of Fullerton India and Real Relief. The sanitary pad has anti-microbial treatment in it and can be used for 12-18 months. 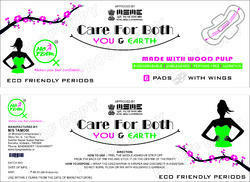 Each pack consists of a night pad + 3 day pads+ a carry cover for using used pad.